ARLINGTON, Texas (AP) — Dak Prescott was getting X-rays on his swollen right hand when rookie Ryan Switzer scored his first career touchdown on an 83-yard punt return. The extra time with the Dallas offense on the sideline kept Prescott from missing any plays, and last year’s NFL Offensive Rookie of the Year led the Cowboys to their first win after three straight losses without suspended star running back Ezekiel Elliott. Prescott threw two touchdown passes, including a franchise record-breaker to Dez Bryant , in the Cowboys’ 38-14 victory over the Washington Redskins on Thursday night. The injury happened in the second quarter when Prescott’s right hand was hit by linebacker Josh Harvey-Clemons just as he made an option pitch to Rod Smith. Thanks to Switzer’s dash to the end zone, Prescott didn’t miss a snap. He said the X-rays came back negative. Bryant’s leaping 13-yard catch in the end zone was the 2014 All-Pro’s first score in six games and 72nd of his career, one more than Hall of Famer Bob Hayes. The Cowboys (6-6) never trailed despite a sluggish start to the offense, thanks to three first-half turnovers and four overall by the Redskins (5-7). Dallas kept it going after halftime with a 21-7 scoring edge after getting outscored 72-6 in the second half during the three-game skid. Alfred Morris, Elliott’s replacement during the six-game suspension for alleged domestic violence, had 127 yards rushing and a clinching touchdown. The Cowboys forced NFL-leading Philadelphia to wait until at least Sunday to clinch the division title. But Dallas still faces a steep climb to playoff contention, and two more games without Elliott. The Redskins had already been eliminated in the division race and are virtually out of the postseason picture after Kirk Cousins threw two interceptions and lost a fumble while throwing two touchdown passes. 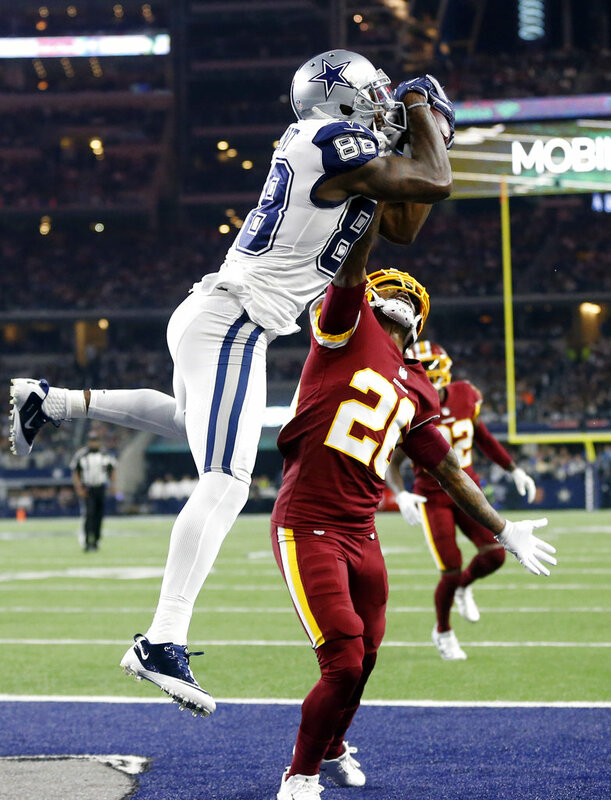 Jamison Crowder let the pass go through his hands on Cousins’ first interception and fumbled on a Dallas punt a few plays later in the Redskins’ fourth straight loss to the Cowboys, the longest such streak in the series since 2003-04. By the time the Redskins answered Switzer’s punt return with a 75-yard drive that ended with Cousins’ 20-yard scoring pass to Ryan Grant , Prescott was ready to return. He had been holding his right hand in his helmet once he returned to the sideline. Rookie backup Cooper Rush had his helmet on when the Redskins punted. Prescott only threw for 102 yards but didn’t have a turnover after throwing five interceptions and losing three fumbles without a touchdown pass during the losing streak. And the Cowboys looked more like the offense they have when Elliott is around, with Morris picking up big yardage on clock-killing drives with the Cowboys in front. Cousins moved the Washington offense sporadically because he was consistently harassed behind a patchwork offensive line that had to shuffle some more because of injuries. Cousins, who was 26 of 37 for 251 yards, was replaced by Colt McCoy late in the fourth quarter. DeMarcus Lawrence, the NFL sacks leader most of the first half of the season, had two of Dallas’ four sacks, ending a two-game drought for the entire team and extending his career high to 13 1/2. Cousins was hit hard by David Irving on a sack in the fourth quarter. Redskins right tackle Morgan Moses didn’t return after injuring an ankle in the first half, forcing Ty Nsekhe to that spot after he was a fill-in starter at left guard on a patchwork line that’s been dealing with injuries all season. Left tackle Trent Williams left the field briefly in the third quarter. He’s been inactive three of the past six games because a knee injury that will require surgery. Washington was already missing center Chase Roullier because of a hand injury. Redskins: At Los Angeles Chargers on Dec. 10. Cowboys: At New York Giants on Dec. 10 to start a season-ending stretch of three of four on the road. Tags: #DallasCowboys, #WashingtonRedskins. Bookmark the permalink.